The Reverend Father Daniel Sysoyev (1974-2009) was a young, married priest of the Church of Russia who was martyred in his church in southern Moscow by a Muslim fanatic during November 2009. Daniel Alekseevich Sysoyev was born on January 12, 1974, to Aleksei Nikolaevich Sysoyev and Anna Midkhatovna Amirova, within a family of teachers and artists. He was later baptised on October 31, 1977 in Vorobyovy Hills. He attended church with his family, assisting in the altar and in the choir at the church where his father was sacristan. Later, Aleksei was later ordained to the priesthood, and his wife (a Tatar) taught Orthodox catechism. Fr Daniel studied in Moscow Theological Seminary, where he had the obedience of choir singer and of leading a mixed choir. In 1993, he describes the beginning of his missionary work on the streets. He was tonsured a reader on December 19, 1994 by Bishop Rostislav of Magadan and Chukotka, beginning a series of great changes. Rdr Daniel was married to Iulia Mikhailovna Brykina on January 22, 1995, by Fr Dionisy Pozdnyaev; on May 13, Bishop Eugene of Vereya ordained him as deacon. Dcn Daniel graduated from Moscow Theological Seminary at the top of the class on June 14, 1995, with his first child (of three) being born later that year. He subsequently enrolled in the correspondence course of the Moscow Theological Academy, and was assigned to the Bulgarian metochion church of the Dormition of the All-Holy Mother of God in Gonchary, Moscow, where he taught the Law of God senior classes of the Yasenevo Orthodox Classical Gymnasium (high school), and was noted for his strictness in compliance with the Typikon and canons, which caused some conflict between himself and Archimandrite Boris (Dobrev), rector of the metochion at the time. From August 1996, the Patriarch blessed him to hold missionary Biblical conversations in the Kriutitsy Patriarchal Metochion with people who had suffered from the influence of sects and, later, occult activities. He began work at the Rehabilitation Centre of St John of Kronstadt, under the direction of hieromonk Anatolius (Berestov). In 1999, Dcn Daniel published his first book, entitled The Chronicle of the Beginning, which was published by Sretensky Monastery and dedicated to the patristic doctrine of creation. 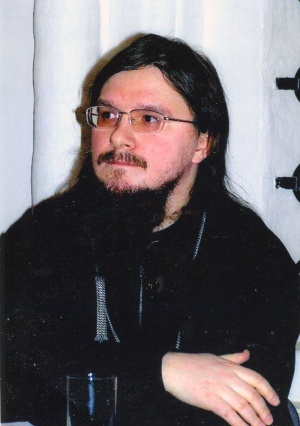 On May 24, 2000, he was awarded a letter of commendation for teaching by the Department of Religious Education and Catechesis; in June of that year, the council of the Moscow Theological Academy approved his thesis, Anthropology and Analysis of the Seventh Day Adventists and the Watchtower Society, and Dcn Daniel graduated. In the same year, Hexaemeron Against Evolution, edited by Dcn Daniel, was published. In 2001, he was ordained to the priesthood, and his second child was born. He was assigned to the Church of Ss Peter and Paul in Yasenevo, Moscow, where he became secretary of the Shestodnev missionary-educational centre and continuing his work at the St John of Kronstadt centre. Around this time, his anthology on Divine Revelation and Contemporary Science was published; over his lifetime, he would publish over a dozen articles on creation and anti-sectarian issues. In 2005, the Moscow city government allocated Fr Daniel's community 0.5 hectares (just under 1.25 acres) of land in Kantemirovskiy, Moscow, for the construction of a stone church, dedicated to the Prophet Daniel. By November 2006, land was cleared of undergrowth and debris by the community, and a small, temporary wooden church was dedicated to the Apostle Thomas. Fr Daniel's parish aimed to convert non-Christians, mostly non-Russians who resided in Moscow, and was in an ideal location to do this, as Kantemirovskiy distict is the district of many expatriate communities and where many different sects are active. The parish runs missionary courses, singing lessons, iconography classes and a scout group. Fr Daniel also opened a catechetical school about the basics of Christianity, and ran a successive five-week catechetical course for those who wished to know more about Christianity (whether for baptism or for interest). In time, a community of Orthodox Tartars (began in 2003) built up, and the information agency of St Akhmet began activity. Fr Daniel's church had initiatives such as an open house, where the church would be open and the priest available for questions. Molebens were frequent, particularly for conversion of the non-Orthodox, and also for students at the nearby Moscow Engineering and Physical University. Fr Daniel later began to offer missionary courses, preparing preachers of the Gospel. In 2009, the parish had some difficulties from the Moscow City Department of Environment Management, due to a change in thought about the use of that allocation of land (changed to a park and nature reserve). Due to popular demand, however, a church remained a part of the draft General Plan for the area. As rector of St. Thomas' church in southern Moscow, Fr Daniel was a noted missionary, especially among the Muslim, neo-Pagans, and Protestant communities of Russia. As the Orthodox Church in Russia has come around to the importance of missionary work in recent years, Fr. Daniel became known for his active missionary work, particularly among non-Orthodox, and also for his bright polemic performances. He established an active missionary movement, including training Orthodox street preachers. He had especially built a reputation as a priest who stood out for his proselytizing work among Russia’s Muslim community, baptising around eighty Muslims . Fr Daniel was also critical of Darwinian evolution. In 2007, Mufti Nafigulla Ashirov, Co-chairman of the Council of Muftis of Russia, sued Fr Daniel in court for his book Marriage to a Muslim, which, the Mufti said, contained expressions offensive to Muslims. Furthermore, journalist Khalida Khamidulina accused Fr Daniel of inciting hatred of Islam in his publications and filed a suit in court against him. At the same time, neo-nazi groups expressed their displeasure with Fr Daniel’s views, and ultra-rightwing Orthodox publications criticised him for his anti-monarchist position. In addition, some Old Ritualist spokesmen believed that he attacked their faith, considering his publications on Old Ritualists as slanderous. They accused him of poor reasoning, faulty judgement, and distortion of historical facts. I have news again. Today, you'll laugh, but Muslims once again have promised to kill me. Now by phone. Already tired. The 14th time. I've got accustomed, but earlier it "strained". And so, God doesn't give - Islam willn't eat. And so, I ask you all to pray. On November 19, 2009, between 23:10-23:20, he was mortally wounded in his church by a Muslim fanatic, who shot him four times. The killer also heavily wounded the parish’s choir director Vladimir Strelbitsky. An hour later around 12:15am on November 20, Fr. Daniel died on the operating table at a Moscow hospital Fr Daniel was 34 years old. Fr. Daniel was the twenty fifth Orthodox priest murdered in Russia after the fall of the Soviet Union. "One of our brothers who has never been to the Caucasus took up the oath of (former independent Chechen president Doku Umarov) and expressed his desire to execute the damned Sysoyev"
Patriarch Kyrill I of Moscow called Fr. Daniel a confessor of the faith and a martyr for the cause of evangelical preaching. This page was last edited on August 4, 2014, at 01:15. This page has been accessed 58,438 times.